This creepy crawler loves to gobble up trash and makes proper waste disposal fun for children of all ages. 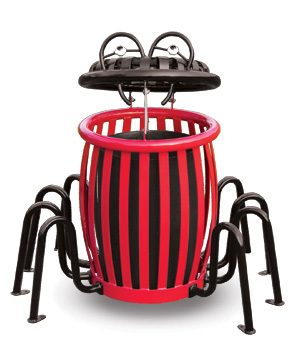 Ideal for parks, zoos, aquariums or playgrounds, the unique spider trash receptacle adds character to any environment. Colors are as shown. Composed with ribbed steel slats, this outdoor trash receptacle will endure years of usage. The removable black 34 gallon liner is accessible through the hinged lid. Receptacle is portable or can also be surface mounted for permanent installment. The state of the art finishing process used on the receptacle combines the application of an 'Electrocoat Zinc Rich Primer' with a durable polyester powder-coat top layer to ensure every crevice and joint is completely sealed, providing full protection against	corrosion and weathering. Receptacles are finished in a gloss polyester powder-coat finish.